Developed in the 1930's, the 357 Magnum is a fantastic self defense and range round. As one of the first magnum rounds, the 357 Magnum is sometimes considered the starter of an age where magnums are well known. Recognized for its great stopping power, this round is just what you need. 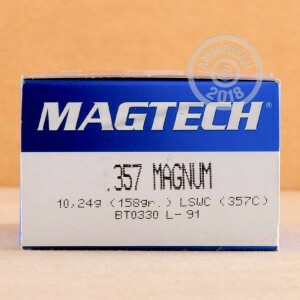 The Magtech brand name was established in 1990 as the commercial name for CBC ammunition. This Brazilian made ammo has a reputation for being reliable and high quality. These 158 grain, lead semi-wadcutter rounds are perfect for range training and target shooting. These rounds cut a clean round hole in the target, instead of your regular shredded hole, which makes for easy scoring when competition shooting. 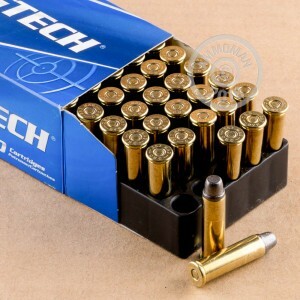 Magtech utilizes fresh brass cases that come boxer primed and can be re-loaded. Need more than 50 rounds? At AmmoMan.com all orders over $99 qualify for Free Shipping!